Less than 50 days to go. Had to make some hard decisions at work, none of which are beneficial to UK manufacturing. Companies that are now shipping goods to Asia and Oceania are doing in blind, by the time the goods arrive there could be an entirely different duty regime. Such thin skin, poor you. must must bruise so easy and go running to mummy. 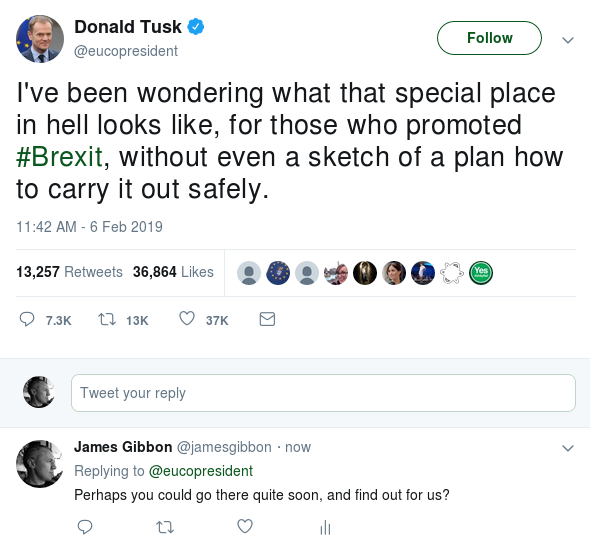 "mum Mum MUM, he said something horrible"
"Don't worry darling try and make some new friends"
Let us deal first with the absurd and preposterous over-reaction to Tusk's remarks. Does anyone remember the tone of debate in Britain over the last forty years? Has it been particularly complimentary towards Europe? I forget. How about the tone in just the last three years? Was it Boris Johnson who likened the EU to Adolf Hitler, and then as foreign secretary warned Brussels not to administer "punishment beatings in the manner of some World War Two movie"? Was it Michael Gove who compared pro-Remain economists to Nazi scientists? Was it current foreign secretary Jeremy Hunt who characterised the EU as a Soviet prison? Yes, reader. Yes it was. Ford looks like it will shut down UK production...how many more of these do we need before people will admit Brexit is a ridiculous folly? Utter madness. "Provided we're happy to live on Spam and canned peaches all will be well"
Now that's a great slogan for the side of a bus! I think the chairman of Tesco quite likes things the way they are, quelle surprise. Not so keen on Spam but I love canned peaches. Compared to a no deal brexit, most people will prefer the way things are now! Why? Because people like the chairman of Tesco are telling us there will be no food in the shops? To be fair that's a very strange statement for him to make when it's a 100% fact that Tesco are stockpiling all sorts of food and goods in preparation for a potential no deal. After all they'll lose even more customers to Lidl and Aldi if their shelves only contained Spam and Canned Peaches ........what about all the Red Tractor Marked ( British ) products they sell for a start..... these types of statements only add fuel to the Brexiteers fire of the leavers scaremongering and prevent honest discussions about the upsides and downsides to leaving the EU. If remainers said we would be stockpiling food and medicines before the referendum leaver would have said SCAREMONGERING. This shows how far the brexit plot is influencing people's minds and we are accepting this mess instead of taking stock and asking is this what people voted for?